124 pages | 8 B/W Illus. 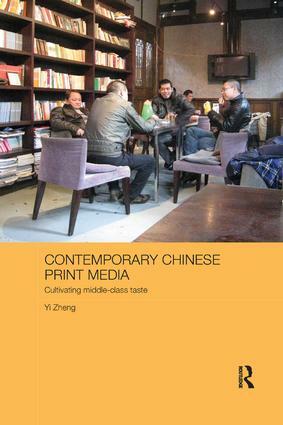 This book examines the transformations in form, genre, and content of contemporary Chinese print media. It describes and analyses the role of post-reform social stratification in the media, focusing particularly on how the changing practices and institutions of the industry correspond to and accelerate the emergence of a relatively affluent urban leisure-reading market. It argues that this reinvention of Chinese print media vis-à-vis the creation of a post-socialist taste (class) culture is an essential part of the cultural and affective transformations in contemporary Chinese society, and demonstrates how the reinvention of such taste culture effectively creates, through new kinds of reading materials and carefully demarcated target audiences, a middle-class civility that serves as the locus of the new niche media market. Yi Zheng is a Senior Lecturer in the School of Humanities and Languages at the University of New South Wales, Australia. She is the author of From Burke and Wordsworth to the Sublime in Modern Chinese Literature (2011) and co-editor of Travelling Facts: the Construction, Distribution, and Accumulation of Knowledge (2004).